We can now with confidence add to our original map as follows. look like they may not have been there originally. have been moved or restored from original positions. 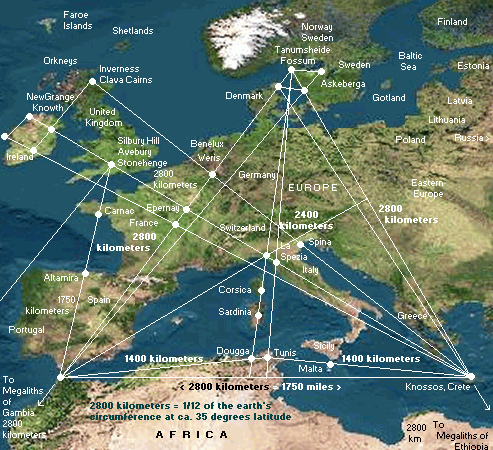 How does one find megaliths in Africa? Initially, I was not even aware that such megaliths existed. However, one of the locations at Kents Cavern, Torquay, Torbay, England- take the virtual tour of Kents Cavern - shows "The Face" - and the face of this man - after investigation by modern graphic methods (size, color, etc.) - in my opinion shows an ancient map of Africa inscribed on it, and how Africa was surveyed in ancient days. Hence I looked for those megaliths in Africa, and found them, where the Face indicated. Apparently, a seafaring journey had been made to Africa ca. 3117 BC or before that. 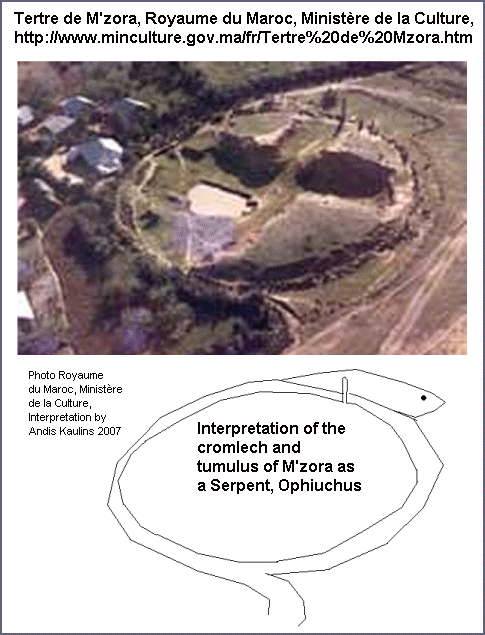 To my great astonishment - the megaliths are still found in the Central African Republic at Bouar. These megaliths in Africa have long been a puzzle to the few scholars who even knew they existed, and now we know why they are there. 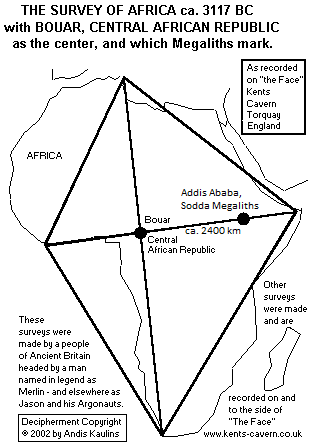 The second graphic above was the clincher for the African analysis, for it was a megalithic site which I found only because of my analysis of "The Face" at Kents Cavern. 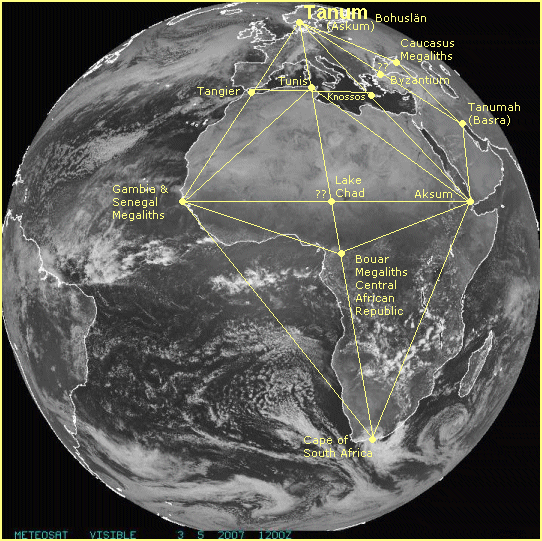 Ancient seafarers must have coastally surveyed Africa by the stars and had found a center by triangulation - which was the center of the longest land distances horizontally and vertically in Africa. They had then journeyed inward to this center. Was this center of Africa at Bouar? It was - and still is. 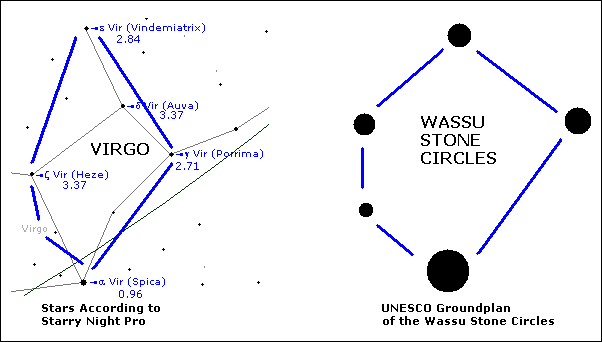 Indeed, the trisquare on the forehead of The Face in Kents Cavern shows us the stars used for triangulation and it is these stars (Draco, Cepheus - perhaps also Cassiopeia) which we find triangulated at Bouar on the ground - even today. 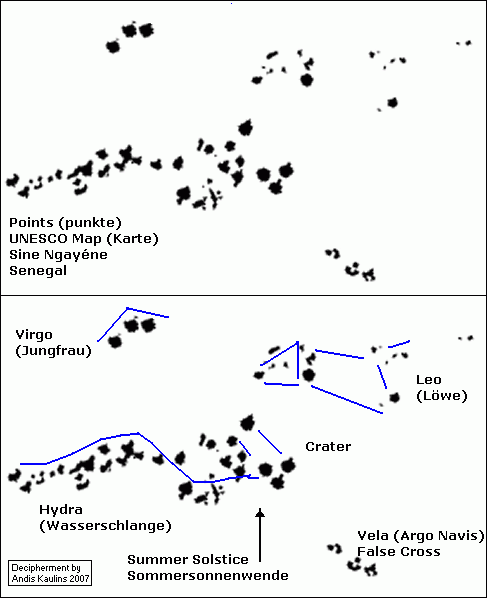 The megaliths at Bouar, are dated by radiocarbon dating to ca. 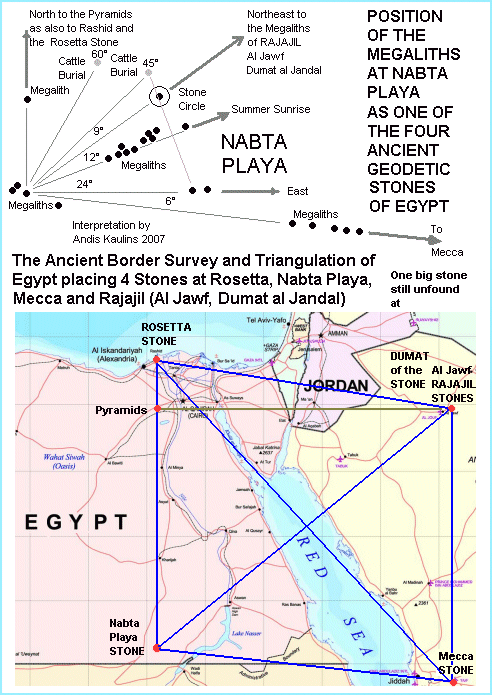 3140-3110 BC (there are also younger radiocarbon dates at the stie and these have been "picked" by the mainstream to avoid labeling the Bouar megaliths an ancient megalithic site, but that is in error). This page was last updated April 17, 2011.